CBD Oil Review rates the Progressive Pet Products, Inc. with two stars because it qualifies for the Quality & Mission Badges. “Our pets need us to help them when they can’t help themselves.” This is the guiding principle behind Progressive Pet Products Inc., a veterinarian-owned company dedicated to helping pets live their best life, the natural way. The ethos behind this brand is sound, and we think the products are too. They need to work on a bit more transparency with lab testing and revealing their hemp sourcing methods to get 100% on their game, but the future looks bright for these passionate individuals. “The minute I saw what CBD oil can do for our precious babies, and it does it naturally?… That was it. 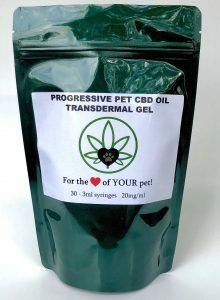 I had to get it to as many of them as I could, even if it helps just one.” These are the words of Lori J. Smith, founder and owner of Progressive Pet Products, Inc. Lori manages her own thriving veterinary practice, but splintered off her efforts to help animals by procuring CBD products after seeing positive effects in real time. The Progressive Pet Products Inc. team consists of an additional veterinarian and other animal lovers determined to improve quality of life for pets. The star of the product line is their CBD oil transdermal gel. It was formulated specifically for cats but can be administered to any pet who may have difficulty with the oral delivery method. Detailed instructions and dosing information are provided. The transdermal gel is applied directly to skin, and this delivery method is known for its long-lasting relief. We approve of its ingredients, only CBD and organic hemp seed oil. 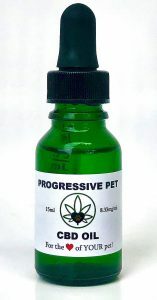 Progressive Pet Products Inc. also offers tinctures in six different sizes for administering to pets orally. The brand is overtly committed to the wellbeing of animals. 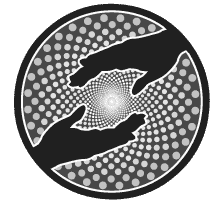 Through their social media platforms, we see that they actively promote the Adopt Don’t Shop Movement, help locate local missing pets, and are engaged in furthering the hemp movement by supporting positive legislation. Unfortunately, it’s just not enough to earn our Charity Badge. Winners of our Charity Badge offer discounts for those in need, donate to nonprofits, and/or donate their time to philanthropic endeavors. Additionally, Progressive Pet Products Inc. does not post lab results online, though they say these are available upon request. They do not disclose where they source their CBD nor the extraction method used. While we feel their products are probably safe, especially seeing as they were developed by veterinarians, we need to observe more transparency to award the Safety Badge. Bottom Line – Progressive Pet Products, Inc. has a team of genuine, qualified individuals dedicated to helping animals. We think they show tremendous promise. Posting test results online, involvement in charitable work, and perhaps an innovative product could put them at a five-star rating in the future. Badges For Progressive Pet Products Inc.
Progressive Pet Products Inc. utilizes its team of veterinarians to ensure quality relief for animals. Progressive Pet Products Inc. is committed to helping animals with a variety of issues through natural benefits associated with CBD.